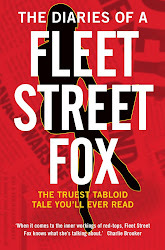 fleet street fox: Pity the hack. THERE are grim jobs, dirty jobs, and downright bloody awful ones. But possibly the worst in Fleet Street this week will be whatever poor soul has to ghostwrite Nancy Dell'Olio's new 'style' column. Yours truly was sniffing around the Wapping bins last night and found an early draft - covered in the Editor's angry red pen, it must be said - clutched to the chest of an exhausted hack unconscious through self-medication and slumped in a nice warm gutter. I have worn the same white shirt to the office every day for 16 years. I quite like it but the rest of my colleagues say I'm boring and to be honest there are yellow patches under the arms and the collar is so frayed it's more of a ruff. What's your advice? Buongiorno. Is easy, you silly silly boy. 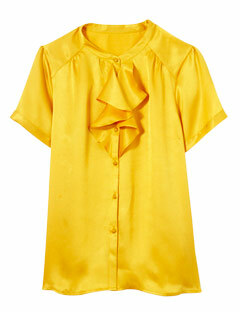 You wear nice yellow shirt so patches no show, I like the silky satin ones they make me feel sexio, here is a-one for you. Next! I've been using the same gothic eye makeup since I was a teenager but now I'm a wizened 27-year-old I think I've outgrown it. Trouble is I can't find a new look that suits me. Have you got any make-up tips? You are little older than Nancy (yes, I know! Is difficult believe I only 25!) and probably donna have a millionaire ex-boyfriend like me who still pay for house and olive-oil massages. I always find that a very light touch with makeup is best as we liedies mature, nothing too heavy, but just enough to make all the guys go a-crazy! My look is very naturale and take me only two hours to apply with trowel. Here is picture me before and after. I have been working in the fashion world for years but can't seem to make it pay, with the added problem that I never feel like I'm good enough. Do you have any advice how to make it as a style columnist and feel better about myself? I am style columnist as everyone love my style. When I was on Strictly Come Dancing everyone vote to keep me in they like me so much and me so good. I suggest you try sequins and thick orange tights, or hang out with Tony Beak. He available now, we no speak much. If you more like Nancy you feel better soon. Every time I put a new frock on everyone demands to know where it's from and calls me a style icon. It's exhausting because I worry about letting people down and worry that one day I will put my foot in it and wear something everyone hates. I do my own make-up but I think my best asset is my hair. You are moderately attractive girl who has fooled some of public into liking you, however you need to up your game if you want be true fashion goddess like me. Have you considered wearing a tomato-red catsuit next time you visit an addiction charity? Your hair all right but too long, maybe you should cut it all off. In my job I need to be inconspicuous and after decades of skulking outside people's houses I own 30 pairs of khaki trousers, two dozen grey hoodies and am incapable of using anything but a water bottle to wee in. Turning up at parties I can go unnoticed for hours at a time, at least until I relieve myself behind a curtain. How can I dress with more flair? You stinky man. Why you no shave? Sit in car all day poo in bag. You need toilet training and proper wardrobe of clothes you wan keep nice. This dress from one my favourite designer, I think when you go to party people notice you more like this. Statement hats very IN this season. When can I have my house back? Who you? I no hear what you say. La la la la la. Do not adjust your mindset. Boxing, (n.): the act of fighting with fists. Let them eat less cake. Outrage (n): act of wanton cruelty or violence.